An exhibition of 142 selected cartoons housed in the Humour of the Peoples art collection was opened within the framework of the 6th International Cartoon Festival in Jiaxing, China. The collection features 52 Bulgarian masters of cartooning - both classical and contemporary artists of the 20th and 21st century who have marked out the history of Bulgarian cartoon. The exhibition was made possible at the formal invitation of Jiaxing Govermnent, hosting the 6th edition of the International Cartoon Festival, and RED MAN Cartoon Center in recognition of the significant role played by the Museum HOUSE OF HUMOUR AND SATIRE in furthering the development of world cartoon for more than 40 years now. It is for the first time that such a group exhibition has been shown to the numerous cartoon fans in China. The travel history of the cartoon collection Eurosapiens added yet another stop - the Municipality of Vinica, Macedonia, lying only 70 km off the Bulgarian border. 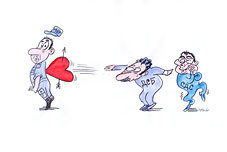 A selected collection of 30 cartoons by 17 Bulgarian artists will be shown during the Fourth Humour and Satire Festival In Vinica veritas held for the humour lovers October 9 - 15, 2012. 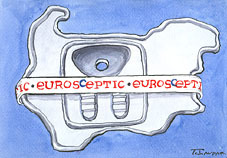 Eurosapiens cartoon exhibition was the output of a national cartoon competition of the same name held by the Museum HOUSE OF HUMOUR AND SATIRE in 2009 under a curatorial project implemented with the financial support of Mr. Nickolay Mladenov, current Minister of Foreign Affairs of the R. Bulgaria and former MEP. 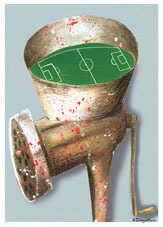 The collection comprises works by 17 contemporary Bulgarian cartoonists, each featured with three cartoons, who offer their own interpretation of hot topics of the day like corruption, violation of consumers' interests, a bind a deaf judicial system, an inefficient administration, the absence of tolerance in public relations and other 'twisted' European practices. The exhibition made a successful debut on April 1st, 2009 in the European Parliament in Brussels. 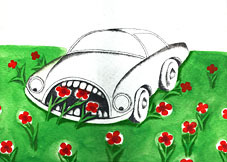 The exhibition features a selected collection of 20 cartoons on ecological subject matter created by outstanding Bulgarian and German masters in the genre. It is part of the travelling exhibition under the same heading organized by the Museum HOUSE OF HUMOUR AND SATIRE and Directorate CENTRAL BALKAN National Park. The international tour of the exhibition has covered the cities Athens, Geneva, Shanghai, Novosibirsk, Ankara and Warsaw. The selected collection is a special greeting to all Bulgarians living in Hamburg and to the Club of Bulgarian Women and Families in particular, on the occasion of All Fools' Day (April 1st) and the 40th birthday of the museum. 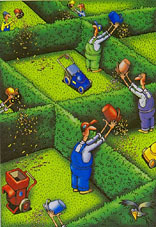 The protection and preservation of the environment is a cause that stirs and engages diffent generations of cartoonists. Their sharp, critical arrows are aimed at human negligence, ignorance, sloth or sheer lack of responsibility in the hope that humour can help people realize and redress their attitude to Mother NATURE - the link that connects and unites all homosapiens. A second collection of selected cartoons from the CARICATOURISTS exhibition will be on show April 1 - 12 at Mara Belcheva House of Culture in the town of Sevlievo. Bulgarian people need no special occasion to celebrate. Neither do they care much about the scene of merry-making. The party may take place in a cafe just round the corner or at home or somewhere out in the open. As long as it is a proper celebration! 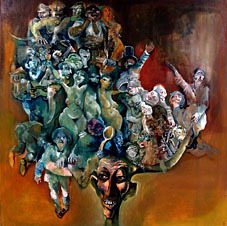 The Festivals of the Bulgarian peo ple features a collection of 35 paintings by 27 Bulgarian artists who worked either in the early 20th c. or in the first decade of the 21st c. All the canvases are housed in the extensive collection of paintings owned by the Museum HOUSE OF HUMOUR AND SATIRE. Crowded festive scenes and compositions - weddings, Christmases, Trifon Zarezan wine festivals or everyday pastime and dances, a relaxing chat or a mysterious coffee-cup reading - draw the viewer's eye with their liveliness, colour and elated spirit. Fire-dancers, mummers, horse-races, games and carnival pageants add to the mosaic of this truly festive show. Laughter therapy must be as old as the world, but what is more, it is a cure free of charge and with a continuing effect. 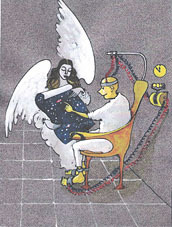 More than 20 years ago the team of the House of Humour and Satire and Dr. Tota Venkova hospital in Gabrovo, in the person of Dr. Todor Shandurkov, embarked on a joint venture to brighten up the corridors and the lobbies in front of the hospital surgeries and consulting rooms with a series of thematic humour exhibitions. The exhibitions still go on, and they continue to serve a single objective - to bring in more cheerfulness, to evoke a rushed smile and an unexpected flood of positive emotions, to provoke sincere laughter both with the hospital personnel and the patients. 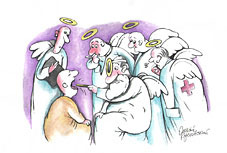 On the eve of April 7th - the professional holiday of all healthcare workers - and on the occasion of its 40th anniversary the House is showing a collection of over 40 cartoons by masters in the genre from 14 countries in the world. 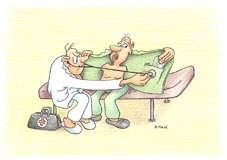 Hardly is there a human being pleased and happy to pay a visit to any surgery; however, the cartoons suggest a possible comic aspect of the scary atmosphere in the operating theatre; of absent-minded attendants and clumsy nurses; of doctors who would rather give an ear to a patient's wallet than to his chest; of the general hospital setting. 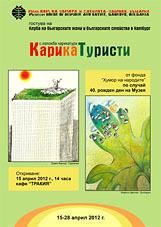 Among the artists on view are classic artists Iliya Beshkov and Boris Dimovski, as well as Gabrovo artist Ivan Tsachev. May the exhibition Smiling Is Wholesome lend extra courage to both healthcare workers and patients at Dr. Tota Venkova hospital ! 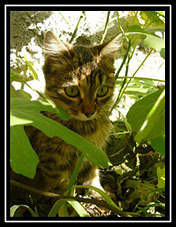 This year spring in BOZHENTSI Reserve of Architecture and History will break with an amusing gallery of feline images submitted last year to the photography competition Cats held jointly by City Culture Medium Come to Gabrovo and the House of Humour and Satire. The current show includes 41 amateur photographs of mask-cats, statuette-cats, cats striking funny poses and even humans in cat's disguise. All photographs entered for the competition - they were m ore than 100 - were donated to the museum collection by the City Culture Medium Come to Gabrovo. Cats thematic exhibition is a playful wink to those who adore the graceful animals, but also to these who pretend not to notice them, for along with Nature, cats are the first to wake up to 'naughty games' as early as March at that. 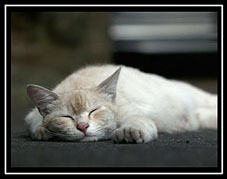 MIAOW!!! Two exhibitions within the framework of the cultural exchange programme carried out by the sister towns of Gabrovo and Thun search for an answer to the question: "What do Swiss people laugh at?" 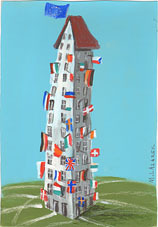 One of the most prominent cartoonists in Switzerland - MICHAEL STREUN - is staging his first solo show in Bulgaria. 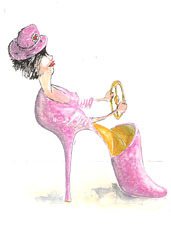 Cartoons & Caricatures by Streun features 62 works drawn over the last 10 years: excellent caricatures and portraits covering both free subject matter and political and social events of great consequence. Michael Streun is an artist whose pursuits go well beyond the genre of cartooning. 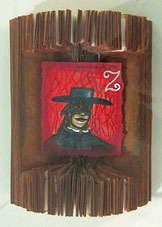 He is equally engaged in painting, illustration, art types and design. His cartoons appear regularly on the pages of various Swiss periodicals. 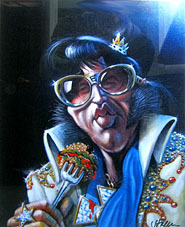 The butts of Michael Streun's caricatures make a motley crowd of personalities: George Bush, Dominique Strauss-Kahn, Barack Obama, Nicolas Sarkozy, Hillary and Bill Clinton, Paris Hilton, Angela Merkel, the Beatles, Edgar Allan Poe, Alice Cooper, Prince Charles, Swiss politicians, fired bank presidents and officers, sportsmen, musicians and writers, as well as Tanya Hristova - Mayor of Gabrovo at present. The exhibition The World through the Mirror of NEBELSPALTER follows the history of the oldest satirical magazine in the world which has been regularly coming out since its first issue of January 1st, 1875. The collection was assembled two years ago to celebrate the 135th of the magazine and comprises 46 panels of cartoons published on Nebelspalter front pages over the years. 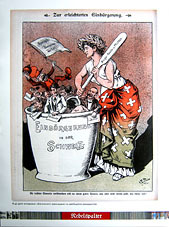 Withstanding censorship and the vicissitudes of time, the satirical magazine has remained a spiritual pillar for generations of Swiss people. 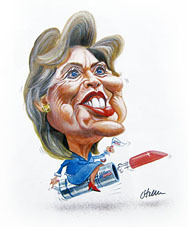 Its archive houses one of the most impressive collections of political cartoons in the world. 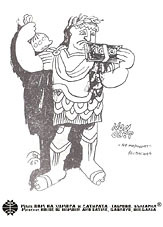 The World through the Mirror of NEBELSPALTER is on show for the first time in Bulgaria, however, the House of Humour and Satire was its regular subscriber from 1980 until 1989. 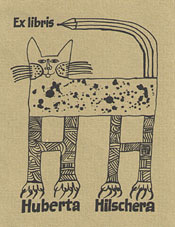 After the 1989 changes, in spite of the financial frustration for the museum to continue its subscription, the House of Humour and Satire kept receiving the periodical as a donation by the editorial-board for another 10 years. In 1991/1992 a work by artist Plamen Penev, a former colleague and an active supporter of the museum, appeared on the pages of prestigious NEBELSPALTER. Guided by the view that small size diminishes neither the value nor the interest in a miniature piece of art, the Museum HOUSE OF HUMOUR AND SATIRE combed its extensive art collection in order to assemble a collection of miniature works - paintings, graphic works, drawings and sculpture - which have not been shown. The exhibition is the latest art event celebrating the 40th anniversary of the museum. "Exquisite and imaginative" is the most concise definition of the displayed 210 works by 80 artists from 20 countries. Among the graphic works on show stand out the names of a number of masters of the ex libris like Russian graphic artists Servey Tyukanov, Vladimir Istomin, Valeriy Babanov, Aleksandar Kolokoltsev and Vladimir Vereshchagin, as well as Andrzej Kot (Poland) and Hermann Huffert (Germany). 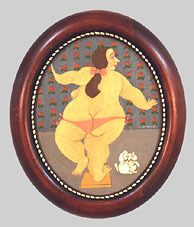 The presence of Bulgarian miniature graphic artists in the exhibition is also impressive. On show are works by Maiya Cholakova, Boris Krastev, Veselin Damyanov, Dimitar Bakalov, Emil Bogomilov, Dimitar Kelbechev, to mention but a few. 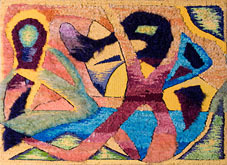 The paintings, which do not exceed the size of a human palm, cover a variety of subject matter - humans, animals, landscapes, everyday life, art, philosophy - interpreted by 22 painters from Australia, Germany, Denmark, Norway, Poland, Romania, Finland, the Netherlands, the Czech Republic, the USA and Bulgaria. Among the miniature pieces of sculpture in the collection are unique 18thcentury bronze figures - weights and measures - used by some African tribes in Ghana and Burma. 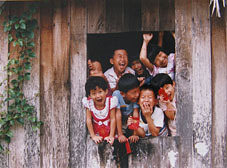 They often represent local sayings and proverbs. The exhibition celebrates the 110th anniversary of the birth of BORIS ANGELUSHEV - eminent Bulgarian artist and founder of book design in Bulgaria. The collection on display features 61 black-and-white drawings done in the first half of the 20th century which are housed in the museum art collection of the House of Humour and Satire. The works in the exhibition are grouped around two focal themes: Uncle Ganyo and To Chicago and back complemented with cartoons and drawings on 20th c. social and political matters. 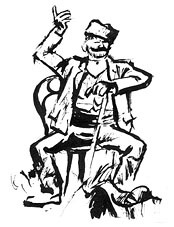 The experts in illustration associate the name of Boris Angelushev with numerous satirical drawings and cartoons on anti-fascist, political and social subject matter; remarkable achievements in the graphic design of post stamps, in the creation of new types and in the development of political poster art. Dubbed by his contemporaries Lord of illustration hardly by accident, Angelushev remained profoundly infatuated with the book art confirming the concept of the overall impact of a book including design, cover, illustrations, text and type. The idea of this original exhibition hit upon artist Sibel Kantola during a tour of the bookstores in South Korea. Wherever she went, she bumped into the superheroes Don Quixote, Batman, Zoro, Phantomas, Superman, Spiderman...as well as the books peopled by them. Turkey-born Kantola felt a kind of a male attribute was missing with them all. 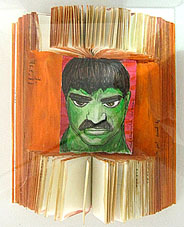 Thus she was struck by the idea to do a small but unusual collection of painted works: moustached superheroes who literally pop out of tiny books. Her show is complemented by the painting Korean Robin Hood and the composition Love Is Not for Everyone. Sibel Kantola is emotionally connected with Bulgaria, for her parents were born here. She has travelled with her family round the world since she was 10, and has studied, worked, taught and done art in Turkey, Russia, the USA, Finland and South Korea. The opportunity to stage her "larky" collection of superheroes in moustaches at the House of Humour and Satire was prompted to her by a former entrant in the International Biennial of Humour and Satire in the Arts. Whether superheroes become even more "super" wearing moustaches is up to the museum visitors to decide. A sense of summer prevails in this new exhibition comprised of 36 posters and 11 pieces of sculpture which definitely belong to the Golden Collections of the House of Humour and Satire. Among the posters on show are works created by prize winners from different editions of the International Biennial of Humour and Satire in the Arts like Kumnam Baik (Republic of Korea), Koji Miwa (Japan), Pekka Loiri (Finland), as well as their Bulgarian colleagues Todor Vardz hiev, Neli Hristova, Lyuba Tomova, Nenko Atanasov and Hristo Velchev. The selected posters treat a variety of subject matter, however, what unites them is the direct message, typical of poster art, the striking graphic mastery and the subtle individual sense of humour and satire demonstarted by 26 contemporary artists from 6 countries. The eleven pieces of sculpture on display are works by artists from Switzerland, Hungary, Germany, Uruguay, Russia and Bulgaria. They beautifully complement the posters and easily raise a laugh with the visitor impressed by their unconventional ideas and sculpting. "...Just a sixth sense! This moment, yes, this moment is right to stir those hearts - hearts vulnerable, kind, tender, fragile and breakable like glass...", says Gabrovo artist Valeri Ferdinandov whose exquisite 12 glass sculptures touch indeed the hearts of all visitors to the House of Humour and Satire. 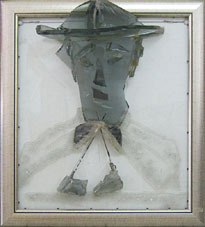 A non-professional artist, Ferdinandov has devoted himself to sculpting fa scinating three-dimensional framed glass "pictures" which cover a gamut of subject matter. Perfectly meeting the specific character of the museum are two glass sculptures - Don Quixote and Sancho Panza and the Dance of the Rolls performed by the unforgettable Charlie Chaplin. The show is made possible thanks to the exceptional support of Enev 98 Ltd, Gabrovo - the artist's sponsor and chief organizer of the exhibition opening. On sale, the works are sure to lend special beauty to any house or office. The exhibition features 52 cartoons by 28 artists from 12 countries, and ranks among the Golden Collections of the Museum HOUSE OF HUMOUR AND SATIRE. The works are a sentimental reference to the span of 40 years over which artists from the world over have made Gabrovo and the museum a tiny part of their lives - most frequently as entrants in the International Biennial of Humour and Satire in the Arts or in thematic national and regional cartoon competitions, or as artists staging solo shows at the House, as well as simply as visitors to the town at the time of the Gabrovo carnival. 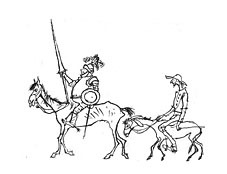 The cartoons on show abound in original ideas and imagery. For some, Gabrovo is the birthplace of the father of Dilma Rousseff, the current President of Brazil, who is in a hurry to visit the town of her roots; for others, the way to Gabrovo is known even to the clouds - as long as one follows their wake; for third, the road signs to Brussels may be confusing, but not to Gabrovo; some artists even depict the House of Humour and Satire as a classic heroine on a pedestal surrounded by adoring 'troubadours' who happen to be none other but representatives of Bulgarian and foreign humour periodicals. 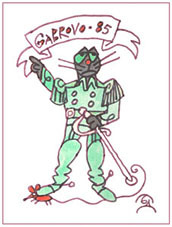 The exhibition encompasses both cartoons from the first Biennial in 1973 and the latest 40th-anniversary graphic greetings that have reached the museum; however, whatever interpretation of the subject matter the works display, one thing is indisputable - the bond with the House of Humour and Satire and Gabrovo is strong and everlasting. It is the message and the heritage left by generations of cartoonists to those coming after them. The exhibition introduces visitors to the House of Humour and Satire to 30 editorial cartoons by Bulgarian artist Ivaylo Ninov. 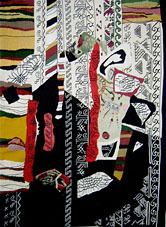 The subject matter is drawn on current social and political life in Bulgaria. This type of cartoons acts like a historical chronicle; the events are recorded and portrayed precisely; the means of expression only enchance the artist's stand and judgement on people and occurrences. Ivaylo Ninov entered for the International Biennial of Hu mour and Satire in the Arts as early as 1983, but Political Faces is his first solo show at the House. His name has been on the pages of a number of Bulgarian newspapers: Starshel, Pogled, Anteni, Vecherni novini, 168 chasa, 24 chasa, Pari, etc. 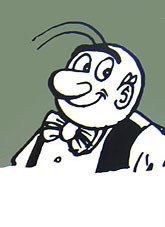 Lovers of Bulgarian cartoon dub him the father of Little Ivancho - a character from his more than 20-year cartoon series. Ivaylo Ninov has shown solo exhibitions in Sofia, Budapest, Vienna, Bratislava, London, Prague, Warsaw, Belgrade and Berlin. The exhibition features 21 selected pieces of sculpture by 19 creators of stone art from Zimbabwe inspired by the mythology of the Shona tribe. 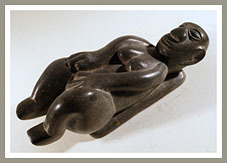 The works on display provide an indisputable evidence that Zimbabwean stone sculpture is a noteworthy art form that originated in Africa in the 20th century. Transforming humans, animals and plants, the sculptures reflect the profound faith of their creators in the magic attributes of the invisible coming from the tribal myths and culture. In the autology of the Shonas 'there is life in everything existing on the earth'. 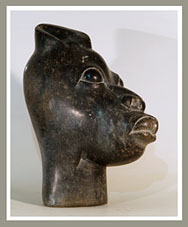 The complete collection of the stone sculpture from Zimbabwe, which is part of the Humour of the Peoples art collection and can rightly be labelled a golden collection of the House of Humour and Satire, comprises 50 pieces of sculpture donated to the museum in 1989 by art lover and farmer Tom Blomefield who initiated and managed at the time the Gallery of Stone Sculpture in the Open in Tengenenge, Zimbabwe. He himself was a special guest at the House of Humour and Satire in May, 1989, during the 9th International Biennial of Humour and Satire in the Arts. 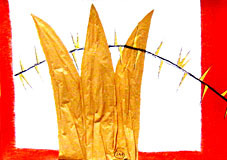 The works on show possess "spirit and life". They strike one with their delicate balance between shape, colour and line. Some sculptures convey humour and satire, and even go as far as grotesque and irony. They are carved mainly out of serpentine, a stone rich in hues and shades. Each work suggests a long 'dialogue' between the stone and the sculptor who is trying to relate his own singular story lending his work a satin sheen. The meeting of the stone spirit and the creator's soul is an awesome and overwhelming magic. Lovers of folk arts and handicrafts, applied arts and Bulgarian traditions interwoven with them are sure to delight in this show of selected works by students from four arts high schools in Bulgaria. The exhibition is entitled after MADCAP Associaiton which was formed in 1996 by the arts high schools in Tryavna, Troyan, Sliven and Smolyan and the House of Humour and Satire to the end of preserving, developing and promoting Bulgarian folk traditions in arts and crafts. 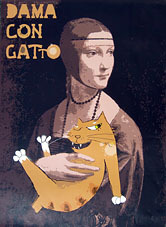 The exhibition is part of a long-term educational programme of the House of Humour and Satire which aims to encourage young talented artists to create humorous works and by entering for the national and international competitions and exhibitions held by the museum to take the first steps in their career development. 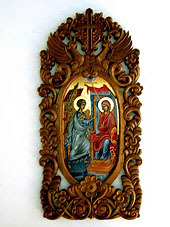 The students from the National School of Applied Arts Tryavna School, Tryavna show 34 works: icon paintings, functional and woodcarved furniture, children's toys, sculpted wooden pieces, woodcarved wall panels and interior designs. 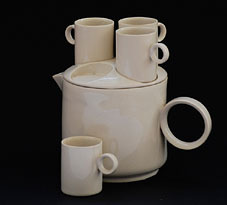 Quite impressive is the representative collection of the Prof. Venko Kolev National High School of Applied Arts, Troyan: 180 pieces of ceramic sculpture and pottery, plates, fruit bowls, vases, sets, jars, pitchers, etc. which fascinate one with their simple, however, perfect shapes, traditional Troyan patterns and soft colours. The items on show continue to lend warmth and cosiness to every present-day home. Dimitar Dobrovich National Arts High School, Sliven is represented by young masters of decorative textiles, icon painters and graphic designers. The study, development and modernization of the carpet-weaving traditions in the region of Sliven are also part of the school curriculum. Proud follower and successor to the Rhodope Mountains traditional arts and handicrafts is the High School of Applied Arts in Smolyan. The current exhibition features textile wall panels, goat's hair and fleecy rugs, carpets, tufted rugs and hand-painted silk, as well as graphic posters, original in design and exquisite in technical execution, made by the students in the school. MADCAP exhibition is an ardent hope - hope and confidence that Bulgarian traditions in folk arts and crafts continue to intrigue and live a new life in the hands of a young generation of master craftsmen! The exhibition features the results from the municipal school competition of the same name, i.e., 255 selected drawings by 255 young artists from ten schools and 3 fine arts schools in Gabrovo. The competition was held on the initiative of the Museum HOUSE OF HUMOUR AND SATIRE, Foundation People Serve Bulgaria: Aalst-Gabrovo - Belgium, Friends of Belgium Club in Gabrovo and Association Public Health Coalition-Gabrovo. It is not the first time that the social issue of smoking and its impact on human health have been on the programme of the House of Humour and Satire. 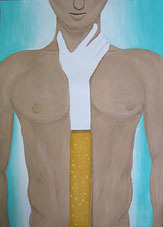 Following the National competition and exhibition Are You Modern or Do You Smoke? 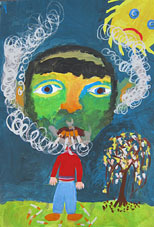 addressed to young people of different ages and held in cooperation with the Bulgarian Ministry of Health in 2008 and the 13th BLAGOLAZH National Meeting of Joke- and Storytellers on Let's Ridicule Vices, the current exhibition is a fresh challenge to the schoolchildren in Gabrovo to express their stand on the vice of smoking in drawings. The results evince vivid imagination,daring ideas and promising talent. The opening of the exhibition will be honoured by a delegation from the Belgian town of Aalst - a sister town of Gabrovo - headed by His Excellency Marc Michielsen, Ambassador of the Kingdom of Belgium to Bulgaria. Recognized as the living legend of Belgian comic strip art in Flemish, Marc Sleen and his art are on show for the first time at the House of Humour and Satire on the personal initiative of His Excellency Marc Michielsen, Ambassador of the Kingdom of Belgium in Sofia. The exhibition comprises 24 panels with comic strips, documentary photographs and textual descriptions revealing incredible stories about humans and animals made up by a superb storyteller, a brilliant cartoonist and a master of comic strip art. Born in 1922, Marc Sleen took drawing lessons every Sunday at the Academy of Arts in Sint Niklaas (Belgium), but his father's early death and the atrocitie s of the World War II turned his life into a string of hardships and tests. It was as late as 1961 when Sleen made his childhood dream come true - he went on his first safari to Kenya and remained infatuated with nature and wildlife for ever after. They would be the inexhastible well of inspiration for the comic strips and documentaries he made. 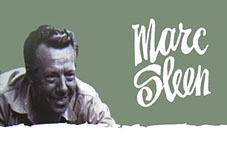 Marc Sleen has authored more than 200 comic strip books; however, his most popular series is Nero and Co. Sleen's comic strip characters often follow the tracks of their spiritual father faced with the wildlife of Africa. Marc Sleen is the administrator of the World Wildlife Fund - Belgium. A museum and a foundation bearing his name have been functioning since 2009. In 1999 King Albert II bestowed upon him the rank of knight. 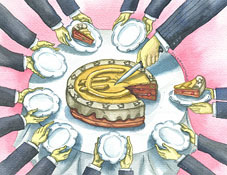 The collection of Polish satirical drawings and cartoons was inspired by the Polish Presidency of the EU in 2011. 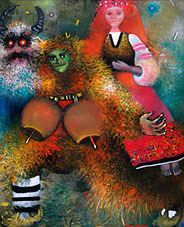 It features works by artists: Julian Bohdanowicz, Jacek Frankowski, Jacek Gawlowski, Sbigniew Jujka, Pawel Kuczynski, Malgorzata Lazarek, Edward Lutczyn, Andrzej Mleczko, Marek Raczkowsky, Henryk Sawka, Janusz Stanny and Grzegorz Szumowski. They belong to different generations of cartoonists, but they have made a name for themselves at various international cartoon fora including the International Biennial of Humour and Satire in the Arts and the House. European Impressions is shown at the Museum HOUSE OF HUMOUR AND SATIRE thanks to the kind cooperation of the Polish Institute in Sofia. The contacts between the two cultural institutions can be traced down to the House's opening and they still keep on developing successfully. The exhibition has already been on display in the Bulgarian towns of Sofia, Burgas, Dobrich, Nova Zagora, Pleven and Pomorie, but has arrived in Gabrovo and the House of Humour and Satire to celebrate the big day - the 40th birthday of the museum. At the formal inauguration Mrs. Agnieszka Kosciuszko, Director of the Polish Institute in Sofia, announced that the collection would remain as a donation to the museum in honour of its anniversary. Teachers and students from the Faculty of Fine Arts at St. St. Cyril and Methodius University of Veliko Tarnovo are celebrating the 40th birthday of the House of Humour and Satire in the museum. They are showing a total of 76 works - posters, graphic works, paintings and sculpture - by 13 teachers and 58 students of theirs. The collection was specially assembled to be thematically relevant to the museum anniversary, even its heading is a pun of the House's motto The World Lasts Because It Laughs. It is a real challenge to measure swords with one's own teachers, particularly in the field of humour, satire and self-irony, but could there be a more definite judgement on a teacher's faculty to teach than a display of his own work side by side with the work created by his students? The exhibition conveys the sensitivity of different generations, but everything in it is unfeigned, vivid and bold. Among the teachers' names stand out Associate Professor Tsvetan Kolev (recipient of the GOLDEN AESOP Grand Prix for 2007) and Prof. Stefan Lyutakov (winner of the first prize for sculpture at Biennial 1999 and chair of the international jury for Biennial 2003). 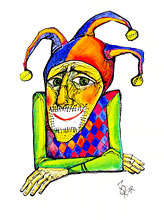 The rest of the participating teachers have been either Biennial entrants or solo exhibitors at the House of Humour and Satire : Associate Professor I. Uzunov, Associate Professor Y. Yordanov, Dr. D. Yaneva, M. Dzhanovski, K. Drumeva, G. Tsvetkova, T. Todorov, M. Karaivanova and M. Mlyachkova. Even Students Last Because They Laugh is a second successful attempt for the House of Humour and Satire and Veliko Tarnovo University to work in cooperation. It aims to introduce young generations of artists to the specific character of the museum, to encourage them to submit works to the International Biennial of Humour and Satire in the Arts, as well as to find in them future supporters and followers. The exhibition is a Christmas greeting to all patients and doctors at Dr. Tota Venkova Multifunctional Hospital for Active Treatment in Gabrovo who regard the preservation of the natural environment we live in an indispensable conditon for their personal health and welfare. 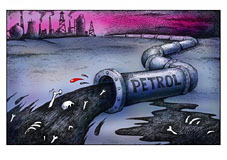 What cartoonist Valeriu Kurtu's 20 colour cartoons appeal for is more care and affection for the green wealth of the planet; protection of waters, wildlife and plants. Born in Moldova, Kurtu has been keen on drawing since school days. He graduated with a major in animation in Moscow, and since 1994 has been living and working as a freelance cartoonist in Germany. He is winner of various prizes at international cartoon contests held in a number of countries all over the world. 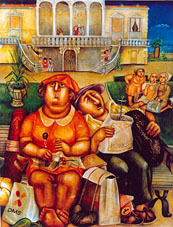 Kurtu's contacts with the Museum HOUSE OF HUMOUR AND SATIRE date back to the first editions of the International Biennial of Humour and Satire in the Arts. Valeriu Kurtu's good-natured humour is enhanced by the rich and bright colours the artist employs which undoubted highlights that the bond between man and nature is as old as the planet Earth itself; that people and Nature are interdependent, and the sooner human beings realize it, the better for everyone. 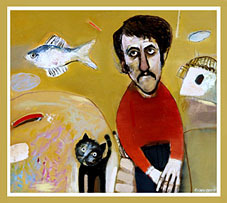 It is 70 years since the birth of remarkable Bulgarian painter Kosta Forev (1942-1993) whose works seem created to decorate the exhibition rooms of no other but a museum of contemporary humour art. On the request of Asenovgrad Municipality, which is organizing a jubilee presentation of its eminent fellow-citizen, the House of Humour and Satire is lending 11 canvases by the artist that are part of the museum core collection. Works by Kosta Forev are also included in the forthcoming display 40 Masters of the Comic to be opened on April 1st at the House; the exhibition is comprised of works by painters, sculptors, cartoonists and graphic artists who have blazed a trail in the 40-year history of the Museum HOUSE OF HUMOUR AND SATIRE. 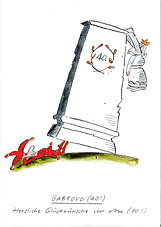 On the occasion of its 40th anniversary the Museum HOUSE OF HUMOUR AND SATIRE is putting on show one of its unfailingly topical collections - Latin sayings and dicta graphically interpreted by inimitable Bulgarian cartoonist Boris Dimovski. 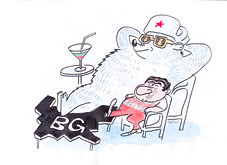 The exhibition features 30 illustrations; however, about 390 works by Dimovski are treasured in the Humour of the Peoples art collection; 63 cartoons were donated to the museum. 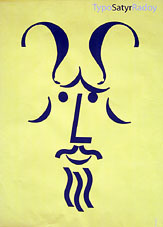 The House of Humour and Satire would hardly be what it is today without Boris Dimovski's original illustrations in the permanent exhibition The Roots of Gabrovo Humour and in the collection Gabrovo Anecdotes; without his Adam and Eve in the Garden of Eden and his quietly grazing donkey; without his creative designs for Gabrovo souvenirs - a memento of the museum all visitors take back home. 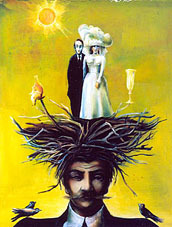 Although Boris Dimovski left this sinful world five years ago, his art remains alive, intransient and time-challenging. As early as 1983 he was conferred the title Honorary Citizen of Gabrovo for his oustanding service to Gabrovo and the House of Humour and Satire. 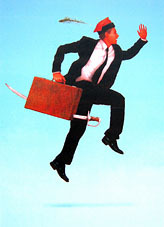 Some of the works have been shown in diffrent editions of the International Biennial of Humour and Satire in the Arts; others are donations made upon the the opening of solo photography shows at the museum. The exhibition includes some genuine achievements of humour in photography that will meet every taste. Thematic exhibition The Festivals of the Bulgarian People is the first item on the calendar of special events dedicated to the celebration of the 40th anniversary of the Museum HOUSE OF HUMOUR AND SATIRE. The scheduled events are designed to highlight the wealth of humour art treasured in the Humour of the Peoples art collection. Bulgarian people love merrymaking and partying; they need neither a special occasion to celebrate, nor a particular place. Their festivals make a singular blend of pagan and Orthodox Church rites and rituals which generates cheerfulness, laughter and a sense of warmth. Hence, the painted festive scenes on display are in bright colours, and convey a vitality and rapture about both traditional Bulgarian feasts and comic moments in the lifestyle and the public life of Bulgarians. However, the paintings also reveal the discriminating eye and mastery of an array of Bulgarian artists who worked during the last 30 years of the 20th century. 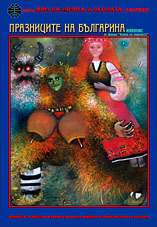 The Festivals of the Bulgarian People collection comprises 60 paintings and features the following artists: Radi Nedlechev, Nikola G. Nikolov, Ivan Dimov, Lyudmil Mladenov, Emil Stoychev, Sava Savov, Georgi Trifonov, Syuleyman Seferov, Vasil Hristov, Dzhamal Emurlov, Keazim Isinov, Valchan Petrov, Kiril Bozhkilov, Dariya Vasilyanska, Zahari Kamenov, Naum Hadzhimladenov, Nusha Goeva, Gredi Assa, Tsvetan Kolev, Zdravko Yonchev, Nikolay Stoev, Kosta Forev, Nikolay Aleksiev, Kalina Atanasova, Valentin Georgiev, Atanas Sharenkov, Lachezar Stanchev, David Perets, Rosen Georgiev, Vladimir Bunardzhiev, Yordan Petrov, Ivan Popchev, Gancho Karabadzhakov and Nedko Solakov. A collection of 11 sculpture compositions by the remarkable Bulgarian sculptors Prof. Georgi Chapkanov, Dimitar Rashkov, Tsvyatko Siromashki, Boris Rusinov, Greta Grigorova, Dimitar Sotirov, Nikolay Razhdashki, Vezhdi Rashidov and Petyo Aleksandrov is a perfect plastic complement to the subject matter of Bulgarian feasts and festivals. 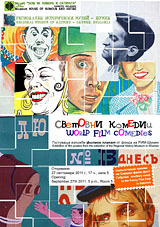 The exhibition is an ancillary event to the second edition of the Funny Film Fest - Gabrovo 2011. It comprises nearly 100 film posters from the collection of the Shumen museum. The Regional History Museum in Shumen has succeeded in purchasing and preserving a collection assembled by Rostislav Bakalov (1912-1992) who not only collected film posters (the collection numbers more than 2 200 posters), but he left behind an exceptional study published in a book by Madarski konnik Film Club under the title Going to the Cinema Once in Shumen. The selected film posters on show take the viewer back to film productions of the 30s-80s of the 20th century, as well as to some 'legends' in the history of world film-making like Charlie Chaplin, Krachun & Malcho, Fernandel, Laurel and Hardy, Alberto Sordi, Louis de Funes, Claudia Cardinale, Bud Spenser, Lyudmila Gurchenko, Yuri Nikulin, Eddie Murphy, and many others. Among the world film masterworks rank unforgettable Bulgarian film comedies starring Apostol Karamitev, Georgi Partsalev, Georgi Kaloyanchev, Stefan Danailov, Todor Kolev to mention but a few. The exhibition will undoubtedly stir the interest of both the older generations, who considered going to the cinema a great treat, and the younger ones, who have never heard of the world famous names mentioned afore. On Febryary 2nd, 2012 inimitable comedy actress STOYANKA MUTAFOVA, loved and acclaimed by generations of Bulgarian people, is celebrating her 90th birthday. In her honour and in honour of the comedy art enriched by her inordinate and outstanding talent the House of Humour and Satire is hosting a kind of a 'party' with selected distinguished guests or rather the images of emblematic Bulgarian figures - actors, authors and artists - represented in 11 painted portraits by established artists Milka Peykova, Bisera Prahova, Georgi Kovachev, Lyuben Zidarov, Dzhemal Emurlov, Todor Yankov, Ivan Dimov and Dimitar Tomov. 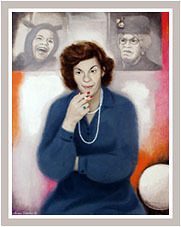 The central place in the spirited company is naturally reserved for the portrait of Stoyanka Mutafova painted by artist Milka Peykova for the International Biennial of Humour and Satire in the Arts in 1985. Displayed around it are the life-like, charming portraits in oils and acrylic of actors Tatyana Lolova, Velko Kanev and Grigor Vachkov; of authors Radoy Ralin, Yordan Radichkov and Petar Neznakomov; of artists Asen Grozev and Prof. Georgi Chapkanov. The works successfully convey not only the physical resemblance of these noteworthy people, but their spiritual essence as well. The jubilee would hardly object to any of her 'selected' guests - all of whom unrivalled and remarkable personalities part of whose life bears on the comic. As a complement to the exhibition of portrait paintings the House of Humour and Satire is showing two films Stoyanka Mutafoca stars in - Whale and Jack of All Trades - striking examples of Bulgarian film-making in the 1960s. This is the first solo show of Plovdiv-based cartoonist Tsocho Peev staged to celebrate his 60th anniversary and more than 30 active years of drawing and painting satire. However, Peev's career as a cartoonist encompasses numerous entries in cartoon competitions and exhibitions in over 20 countries. The exhibition features exactly 60 cartoons created at different stages of the cartoonist's work life which, in art critic Svetla Moskova's words "are short stories without words, but with much freedom for individual interpretation. Whichever subject matter Tsocho Peev tackles, "he provides amusement to us and to himself because there is no greater pleasure in art than enjoying oneself while creating works of art "
"In my opinion", continues Ms. Moskova, Tsocho Peev is an extraordinary artist; an artist who is in a brilliant command of his craft no matter whether he employs ink, gouache, watercolour, distemper, brush, pastel, a ball-point pen or a nib. No stroke of his comes by accident. Peev reneders his cartoons on a sheer white background, giving prominenece to the free drawing, grading colours, contasting or bringing them in consonance with each other." The Museum HOUSE OF HUMOUR AND SATIRE is truly delighted to play host to this so intimate celebration of Bulgarian cartoonist Tsocho Peev.